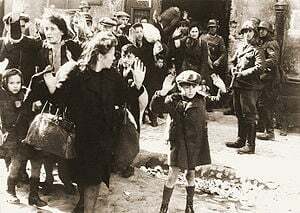 One of the haunting images of Jewish heroism, lauded in history books and Holocaust commemorations, is the courage of those, especially the young, in the Warsaw Ghetto, when in 1940, Jewish Warsaw residents were ordered by the German invaders into a small section of the city. The courage of those who dug tunnels, smuggled goods necessary for survival in, and communications in and out, has rightly become a legendary act of resistance and courage, defiance in the shadow of despotism and repression. The Jewish families were contained in their enclave by an up to three metre high wall.The people of Gaza, ironically, are largely contained by a wall up to eleven metres high – twice the height of the Berlin Wall. The Palestinians, their lands, homes, even cemeteries, stolen and destroyed, their ancient olive groves – some trees a thousand years old – burned or stolen to grace often illegal settlements, their people spat at, imprisoned, tortured, bombed, walled in, is now also near land-locked by Israel’s maritime aggression in Gaza’s territorial waters. Even fishing, unfettered access to their bountiful fish stocks are often denied, threatened by gun boats. Gaza, since 2000 especially, has become a sunnier Warsaw Ghetto. Imports are strangulatingly controlled or totally prohibited by Israel, thus lifeline tunnels have also been dug between Gaza and Egypt. In the building of one such desperation-driven structure: “in the cold, often trapped and suffocating under water or collapsing walls of dirt and concrete, eighty two people died”, working in shifts, twenty four hours a day, Hyam Noir and Fady Adwan write graphically. Goods brought through the tunnels, as in Nazi occupied Warsaw seventy years earlier, are life’s necessities for survival and include medicines, food, clothes, vital spare parts, foreign currency. World governments either collude with this ongoing humanitarian tragedy and legal shame, or simply ignore Gaza’s plight. That Balfour stated clearly that the Jewish people were to be guests in Palestine, not jailers and conquerors, has been ignored from literally, day one. For building their subterranean mainstay, the rightful residents of Palestine are called terrorists. Shame on every politician, of any country who colludes with, or ignores this ongoing obscenity.